In reaction to the SONA of President Rodrigo Duterte, the labor group Partido Manggagawa (PM) today called him out for being less than honest on his statement about contractualization. 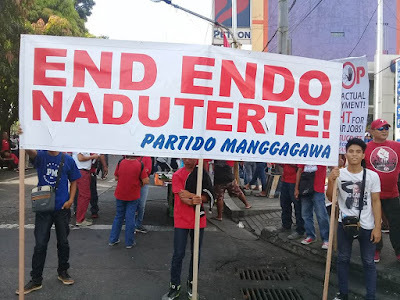 “PRRD obviously feels the pressure of the workers’ demand against contractualization but still refuses to heed the demand to decisively end it. Workers have enough of his alibis and broken promises. It is up to workers movement to fight for an end to endo,” he added. Yesterday, PM mobilized a thousand workers and poor in a “tambay protest” in the NHA main office before joining the massive United People’s SONA. The group and its affiliated Alyansa ng Maralitang Pilipino (AMP) slammed the NHA for being negligent or “tambay” in providing for the housing needs of the poor thus resulting in unused units and years-old wait for beneficiaries. PM chapters in the cities of Cebu, Bacolod and Davao also joined rallies or activities together with other groups in those areas as part of the nationwide counter-SONA events. “We shed no tears for the hour-long delay in the SONA. The House intramurals expose that the old rotten politics is alive and kicking under PRRD despite his repeated promises of change. Bulok, bulok, bulok sa halip na build, build, build,” Magtubo asserted. “Workers and the poor are suffering under PRRD. Besides endo and inflation, workers communities are ravaged by the bloody war on drugs and the wanton arrest of tambays. Which will be relentless as PRRD has insisted in SONA 2018. Human lives are protected and upheld by human rights despite PRRD’s rhetoric. The more than 12,000 mostly poor Filipinos who have been killed in the war on drugs unequivocally reveals that human lives are lost when human rights are disparaged,” Magtubo averred.